Hans Cottage Crocodile pond | Your Beach House in Ghana • Right at the ocean! The Hans Cottage Botel is located in a serene environment and the collection of plants and birds are beautiful. The setting is pleasant, partly built on stilts on a pond, with a swimming pool and nice greenery. There are crocodiles, turtles and various bird species to be seen (and a large colony of weaver birds building their nests around the water). You can pay a small fee to see the crocodiles being fed. 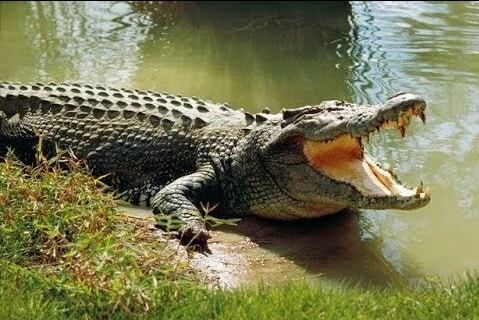 It is easiest to spot crocodiles in the evening or morning, so you may wish to spend the night at the Hans botel. The hotel is strategically located, close to well-known tourism highlights such as Cape Coast, Elmina, Kakum, Monkey forest reserve (zoo).